If you’ve ever thought that you should open the door when opportunity comes knocking? Listen up: it’s pounding on your door. It’s not often that we in the public safety community are approached with an opportunity to hothouse innovation, but this is one of those times. This week the call went out specifically to those with ideas to innovate within the public safety sphere from FastFWD; a partnership between The City of Philadelphia, social enterprise accelerator GoodCompany Group and the Wharton Social Impact Initiative. They’re seeking anyone in the world – this is not limited to those in Philadelphia. Those selected will be given access to city leadership, business acceleration (mentoring, knowledge transfer, subject matter expertise, etc) and capital. The deal is essentially this: if you have a company or an idea on how to innovate within public safety – within the broad subject categories of Neighborhood Surveillance, Vacant Lots, Recidivism/re-entry employment or enabling technology – you may qualify for the FasfFWD program. It is very important to recognize that the program doesn’t have any specific solutions in mind. This is truly an open call to create, to innovate, to lead. In an intensely brilliant effort, the group recognizes that, while they can see the problem areas in which they desire to foster and foment change, the private sector…innovators…you are the change agent. They’ve set the program up with every effort to help you succeed. The access comes directly from the City; Mayor Nutter and his impressive team are dedicated to establishing true public-private partnerships to foster innovation and create truly breakthrough innovations to move the city forward. The acceleration comes from GoodCompany Group, which has stonking huge tons of experience at bringing entrepreneurs together with the resources they need – including those at Wharton (which knows a thing or two about, you know, business) to excel, and bring dreams to reality. And the money comes through a prize that the City won with the Bloomberg Philanthropies’ Mayors Challenge, a competition to inspire American cities to generate innovative ideas that solve major challenges and improve city life. The Mayors Challenge will fund the first two issue areas to be tackled by FastFWD. It’s important to note that the money – $10,000 in this case – does not come with strings: there’s no equity stake. FastFWD just wants to help you succeed. Over the years, my business partner David Henderson and I have written extensively about public safety innovation and technology. 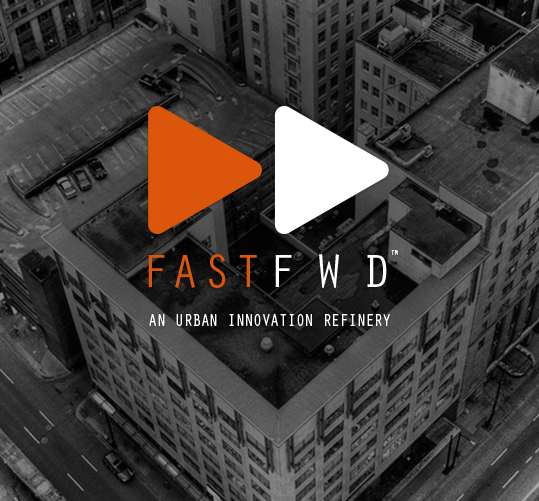 We’re both here to say that, if you’ve ever had an idea; if you’ve ever considered doing something to change that which you see can be changed to improve public safety or our communities, we urge you to look into FastFWD and consider applying. It’s been said that cops hate change and the way things are. We in pubic safety became what we are through a desire to make a difference. FastFWD may very well launch your idea into a new orbit in which you are able to make a difference on a much, much bigger scale. Applications will be accepted on a rolling basis from October 21st through December 15th. Finalists will be invited to interview with a panel of venture capital and domain experts. Got an idea? Opportunity is knocking. Right now.